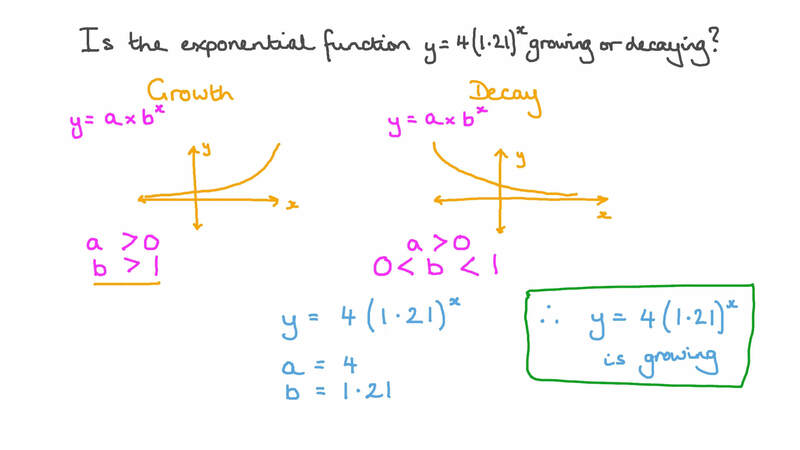 In this lesson, we will learn how to set up and solve exponential growth and decay equations and how to interpret their solutions. Is the exponential function 𝑦 = 4 ( 1 . 2 1 ) 𝑥 growing or decaying? The population, 𝑁 , of a city in year 𝑡 is given by the formula 𝑁 = 1 0 ( 2 . 6 )         . Determine the year in which the population of the city was 8 million. Bassem invests in a savings account. After ten years, the value of his investment had doubled. What was the annual rate of interest? Give your answer to one decimal place. A population of bacteria in a petri dish hours after the culture has started is given by . Sarah says this means that the growth rate is per hour. Her friend Engy, however, says that the hourly growth rate is . Who is right? The value of a car falls by 3 6 % over 2 years. By considering a suitable exponential function, find the equivalent annual rate of depreciation that would produce the same fall in value over two years. The given figure shows the concentration 𝑐 , in micrograms per liter, of a certain drug in human blood plasma measured at different times. Considering that the concentration after ℎ hours can be modeled with the function 𝑐 = 1 8 ⋅ 0 . 7 5  , by what percentage does the drug’s concentration decrease every hour? A car’s value depreciates by 𝑟 % every year. A new car costs 𝑃 d o l l a r s .
Write a function that can be used to calculate 𝑉 , the car’s value in dollars, after 𝑡 years. What is the value of 𝑟 for which the car’s value will be halved in 3 years? Give your answer to the nearest whole number.